Prime Minister Theresa May has been holding talks with MPs in the aftermath of the heavy defeat of her Brexit deal in the Commons – and following a slim victory in a no-confidence vote. 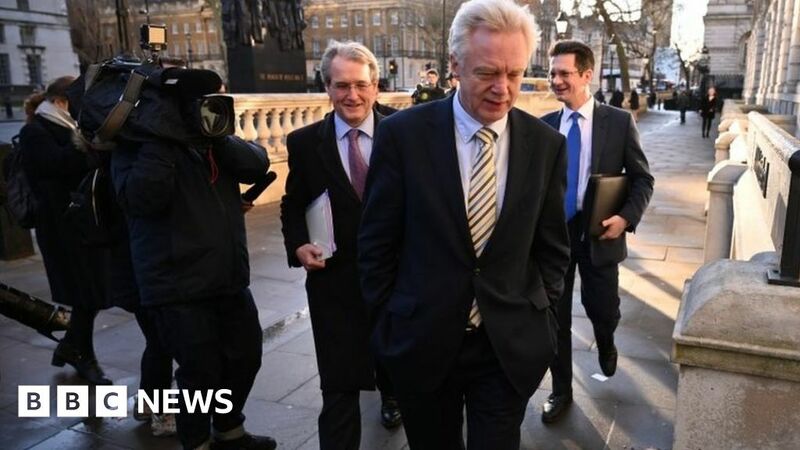 Environment Secretary Michael Gove, Cabinet Office Minister David Lidington and Brexit Secretary Steve Barclay are also holding talks with senior opposition politicians. Meetings are being held in No 10 Downing Street and 70 Whitehall, the Cabinet Office. First up was SNP Westminster leader Ian Blackford, Plaid Cymru’s Westminster leader, Liz Saville Roberts, and Lib Dem leader Sir Vince Cable, who all had talks with the prime minister on Wednesday night. Mr Blackford said that the extension of Article 50 – the two-year mechanism that means the UK leaves the EU on 29 March – the ruling out of a no-deal Brexit, and the option of another EU referendum would have to form the basis of future discussions. Ms Saville Roberts said they were “committed to finding a real solution” but “that means taking a no-deal Brexit off the table and a people’s vote on our European future”. Sir Vince said he was encouraged by Mrs May’s “willingness to talk about these issues in detail”. The preferred choice of his party is another referendum. Labour leader and leader of the opposition Jeremy Corbyn said he was “quite happy” to talk with Mrs May but she had to rule out a no-deal Brexit first. Tory colleagues and Brexiteers Owen Paterson, Iain Duncan Smith, David Davis, Mark Francois and Steve Baker were among the first politicians spotted in Whitehall on Thursday morning, as well as Conservative MP and former Northern Irish Secretary Theresa Villiers. They are all members of the Tories’ influential European Research Group (ERG). Brexiteer John Whittingdale tweeted afterwards that their group’s meeting with the prime minister had been “constructive”. Former Conservative cabinet minister Mr Paterson described the meeting as “thoroughly worthwhile”, “very constructive” and a “good exchange”. Sir Graham Brady, who chairs the 1922 Committee of Tory backbenchers, and Cheryl Gillan, MP for Chesham and Amersham and a vice-chair of the 1922 Committee, were also seen arriving at the Cabinet Office. They were later photographed leaving Downing Street with other members of the committee, after a meeting with the prime minister. 09:00 GMT – After her meeting with the prime minister, Caroline Lucas, the Green Party’s only MP, said Mrs May had refused to rule out a no-deal Brexit and resisted the option of extending Article 50. “I repeatedly urged her again and again to take no-deal off the table because I think it completely skews the talks – because you know that cliff edge is there,” she said. 10:40 – DUP leader Arlene Foster and DUP Westminster leader Nigel Dodds arrived for their meeting. The prime minister relies on their party’s support to prop up her government. Speaking in Downing Street following their meeting with Mrs May, Ms Foster said the prime minister had been in “listening mode” and there had been optimism that a Brexit deal could still be reached. She said she had made a “clear ask” in relation to the Irish backstop, urging Mrs May to address it “in a satisfactory way”. Tom Brake, the Lib Dem’s Brexit spokesman, Alistair Carmichael, the Lib Dem’s chief whip, and deputy Lib Dem leader Jo Swinson were all spotted arriving to the Cabinet Office. After his meeting with Mr Lidington, Mr Brake said a no-deal Brexit needed to be off the table. 10:49 – Conservative MP Shailesh Vara arrived at the Cabinet Office. 11:27 – Plaid Cymru leader Adam Price met with Mr Lidington and Mr Gove, who he said had been in “listening mode”. “If the government were to come out on Monday with that position [of another referendum] then the gridlock, the impasse, the logjam would be broken, and we could move forward,” Mr Price said. 11:30 – Conservative MP Nicky Morgan, who chairs the Treasury Select Committee, arrived at the Cabinet Office. After 12:00 – Tory MPs Damian Green and Andrew Mitchell spoke to journalists outside the Cabinet Office after their meeting. “No two members of Parliament think precisely the same way but now we’ve got to make progress,” Mr Mitchell said. Mr Green, a close ally of Mrs May, criticised Mr Corbyn’s decision not to take part in the talks, saying the move was “completely absurd”. John Mann, a Leave-supporting Labour MP and long-term critic of Mr Corbyn, was spotted coming out of the Cabinet Office. 13:05 – Tory MPs George Freeman and James Cartlidge arrived at the Cabinet Office. 13:57 – Labour MPs Yvette Cooper, who chairs the Home Affairs Select Committee, and Hilary Benn, who chairs the Brexit Select Committee, arrived at the Cabinet Office. After meeting Mr Lidington, Mr Benn said the government had to rule out a no-deal Brexit as a first step and secondly the prime minister had to change her “red lines”. They said they had attended the meeting in their capacity as chairs of cross-parliamentary committees, after Mr Corbyn barred Labour MPs from taking part in the talks while a no-deal Brexit remains an option. 14:07 – Tory MPs Peter Bone and Tom Pursglove arrived at the Cabinet Office. On his way to meet the prime minister, Eurosceptic Mr Bone said he was “hopeful we can get a deal”. 15:31 – Tory MPs Tom Pursglove and Julian Lewis were seen leaving the Cabinet Office. 15:50 – Labour MP Stephen Kinnock went into the Cabinet Office. 16:08 – Tory MPs Steve Brine, Richard Harrington, Robert Buckland and Margot James were spotted outside the Cabinet Office.